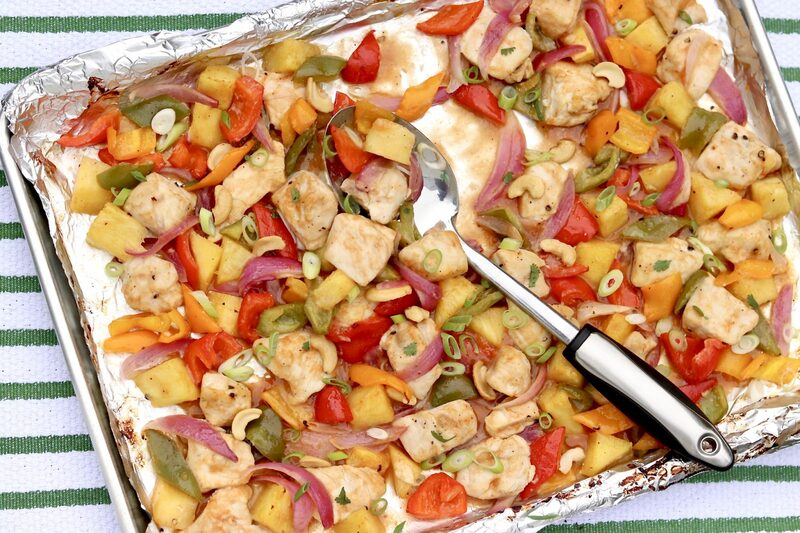 Sheet Pan Sweet & Sour Chicken ~ Sweet and spicy mingle with a hint of heat in this family-friendly sheet pan meal that’s worthy of a spot on the weekly dinner rotation. The prep-ahead sauce stores well and makes enough for a second meal another night. Or use it for quick stir-fries and other recipes calling for sweet and sour sauce. Opposites attract, or so the saying goes. Running counter to that piece of conventional wisdom, however, the professor in my college Psych 101 class asserted that, in more cases than not, birds of a feather do, in fact, flock together. Whichever side of the debate you champion, there’s no denying that many of us are drawn to people who balance our dominant traits with complementary attributes. When we apply this logic to food, it’s clear that there’s no right answer – only endless potentially delicious possibilities. Whether analyzing recipes or relationships, similarities tend to be comforting, safe, and dependable, while differences may introduce an element of excitement, adventure, and even risk. It likely comes as no surprise that my study of psychology extended no further than that intro college class, yet I’d postulate that in both cases, the best outcomes occur when various elements complement each other rather than compete. Popular pairings reinforce this notion – think peanut butter and jelly, chips and dip, and salted caramel. I do know someone who likes to spread peanut butter on his tuna fish sandwich, so make what you will of that! Generally speaking though, juxtapositions of sweet and salty, hot and cold, and creamy and crunchy add interest and appeal to so many dishes. 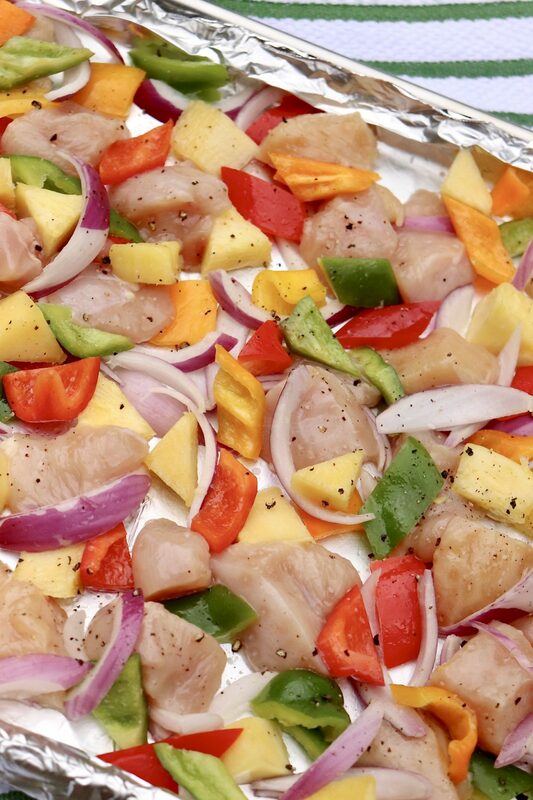 Similarly, sweet and sour ingredients mingle nicely in the following meal, where both chicken and veggies conveniently bake on a single sheet pan. Because sweet and spicy play well together, too, the sauce includes an element of heat. The result is no hotter than a medium salsa and can easily be adjusted to taste. As a bonus, the sauce can be prepared well in advance and will keep for several weeks in the refrigerator. It will also provide enough for two dinners, offering added ease the second time around. Sweet and spicy mingle with a hint of heat in this family-friendly sheet pan meal that’s worthy of a spot on the weekly dinner rotation. The prep-ahead sauce stores well and makes enough for a second meal another night. 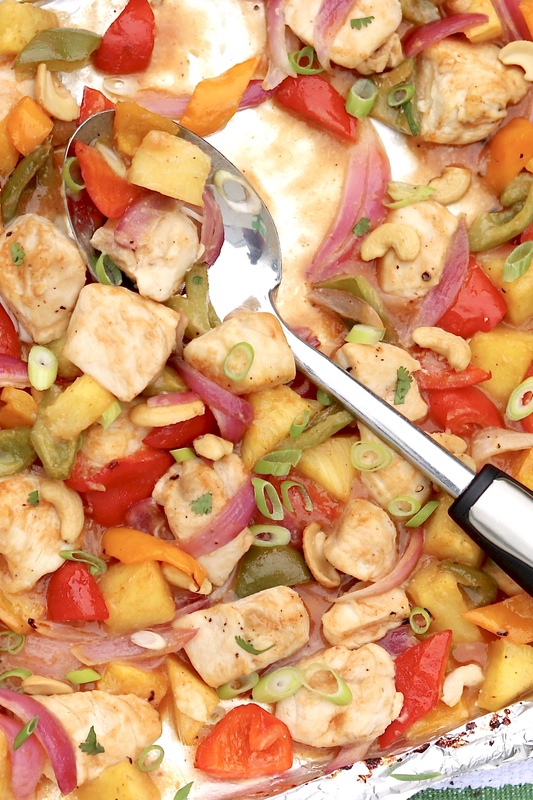 Cut the chicken, bell peppers, onion, and pineapple into one-inch pieces. In a large bowl or directly on the sheet pan, toss with the oil, and then spread into an even layer over the prepared pan. Sprinkle lightly with salt and pepper. Bake the mixture for 15 minutes, and then remove the pan from the oven. If there is liquid on the pan that has cooked out of the chicken or pineapple, drain it off by carefully tilting the pan and spooning it off. This will prevent a watered-down sauce. Stir in just over 1/2 cup (or about half) of the sweet & sour sauce. Toss to incorporate, spread the mixture evenly over the pan, and then return to the oven for about 5 more minutes or until the chicken is just cooked through. (This could take a few extra minutes if chicken pieces have been cut on the larger side – and oven temperatures do vary.) Alternatively, I like to switch to the broil setting after the sauce has been added and broil the mixture for a minute or two, watching very closely to avoid burning, to finish cooking and lightly caramelize. Sprinkle with optional toppings and serve with rice if desired. Place the vinegar, brown sugar, ketchup, pineapple juice, cornstarch/water mix, sriracha, and soy sauce in a small saucepan. Cook over medium heat, stirring occasionally, until the sauce begins to gently boil. It will darken in color and become thicker. Immediately reduce heat to keep warm, or let cool, and then store in a jar in the refrigerator. The sauce will keep for 2 weeks, give or take. 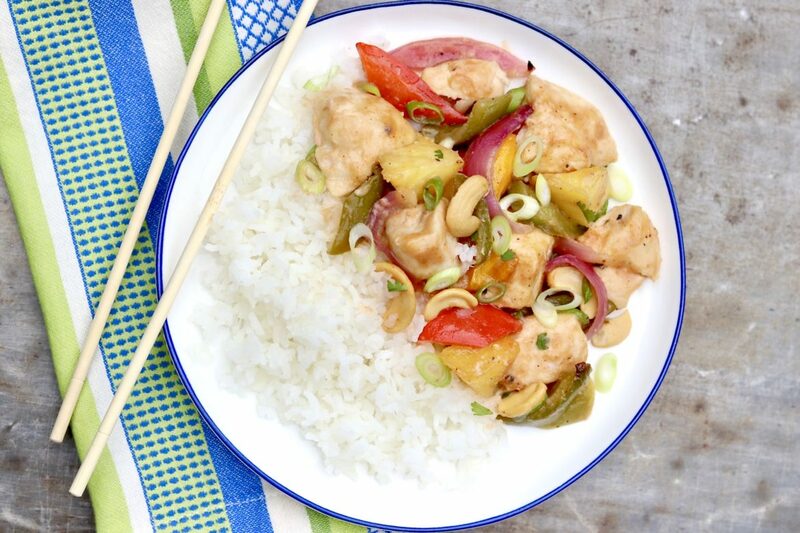 *My kids and I adore how the sweet notes of the pineapple contrast the sour and spicy flavors in this recipe. That said, not everyone likes mixing fruit and vegetables in the same dish, and my husband loves this meal even more without the pineapple. Accordingly, I use about 1 1/2 cups for a balance that everyone in our family enjoys. Feel free to choose an amount based on preferences in your own group. I prefer to use fresh pineapple when available, although canned may be used – in which case you may use the drained juice in the sauce recipe. Optionally, the small 6-ounce cans that Dole offers need not be refrigerated until opened and are ideal when a small amount of pineapple juice is called for in a recipe. I use half for one dinner and refrigerate the remaining sauce for another batch in the following week or two. Alternatively, extra sauce may be used to flavor rice that may be served alongside. The sauce may also be used for other recipes calling for sweet & sour sauce. Would omitting the sriracha (1/2 Tbl) in the Sheet Pan Sweet & Sour Chicken still make a tasty sauce? Love your column…Thanks! Hi Beverly, I think it would still taste good, perhaps just a little sweeter as the sriracha tempers that somewhat. If it’s a matter of not having the hot sauce on hand (as opposed to not wanting any spiciness), you could add a touch of cayenne pepper or red pepper flakes…even a few dashes of Tabasco. If you try, I’d love to know how you make out, and I’m delighted you enjoy my column! Ate this for dinner this evening and everyone declared it a “make again soon” recipe. Great flavor and all around easy meal! Great news, Emily. I’m thrilled your family thinks it’s a keeper! This is delicious and so fast and easy to make. I appreciate this is a healthier version of our favorite Chinese take out. Served this over brown rice, used chopsticks I had on hand and purchased some fortune cookies at the grocery store – what a fun dinner we had! Thanks, Ann, for another wonderful recipe. I love it! Fortune cookies and chopsticks make the meal so much fun. So happy it was a hit! 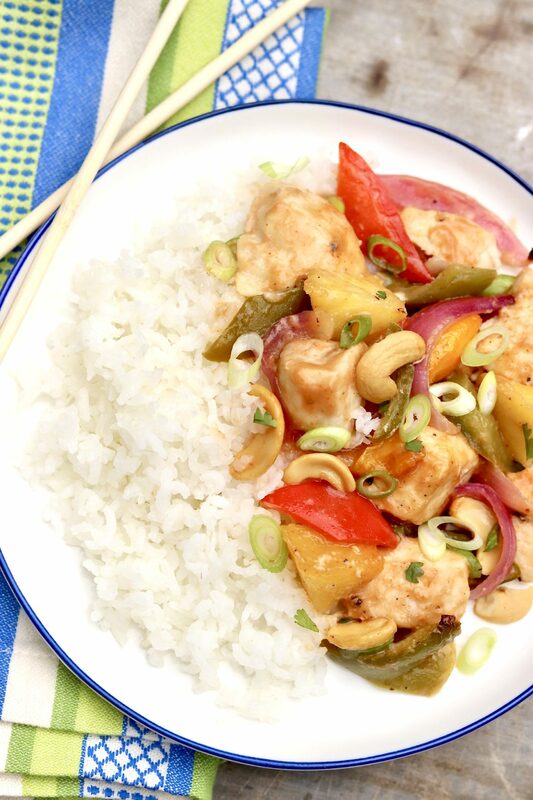 We love takeout sweet and sour chicken so this recipe caught my eye when you first posted it. I have made it quite a few times since and thought I should come back to comment. It is absolutely delicious and I appreciate how much healthier it is than the restaurant version. Thank you for another keeper! I’m delighted this is a keeper and stands up well to your favorite takeout!